Only the mater of this astrolabe survives. 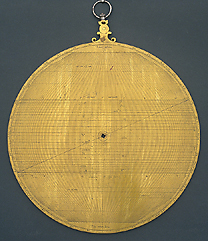 The back of the astrolabe has a Rojas-type planispheric projection of the celestial sphere. This instrument belonged to the bequest left by Sir Robert Dudley to the Grand Duke of Tuscany.